Review date: 13 October 2003. I think it's fair to say that the computing world is not under-supplied with deluxe mouse pads. Back before all-surface optical mouses existed - when, never mind speed and precision, a good mouse pad could save you considerable roller-cleaning time - there was the 3M Precise Mousing Surface. The unfortunately-acronymed PMS beat the heck out of the awful oblongs of wetsuit fabric and medium-hard plastic-fronted company-advertising mats that were the only other options besides a piece of paper or a bare desk, but it was rather high friction, and very easy to damage. Then came Everglide and Ratpadz and fUnc, and now we've got Steelpads and Icemats and Speed-Pads, just to name a few. And, angels and ministers of grace preserve us, even mouse pad mods. XTrac, therefore, would seem to have their work cut out for them. I wouldn't want to be trying to jam new premium mouse pads into this already well-filled market niche. On the left, the XTrac Pro. On the right, the XTrac Zoom. The Pro's a very floppy rubber-backed mat which is possibly the single most rubbery-smelling thing, weight for weight, I have ever encountered. Users who aren't instantly struck dead by Multiple Chemical Sensitivity symptoms upon taking the Pro out of its packet may think it's just a slimmer version of an old-style wetsuit-fabric mat. It's a bit bigger than the bad old mats, at 8.5 by 11 inches (well, officially; the Pro I got for review is more like 8.5 by 10.5 inches), and it's a scant eighth of an inch thick. But it's got a cloth front and a grippy rubber back, which may well bring back bad memories. Fortunately, the Pro is not an old fashioned mouse mat. I was very pleasantly surprised by how slick it actually turned out to be; its fabric face means it's inescapably a higher-drag mat than the Everglide Giganta Optical I usually use (and reviewed here), but it's really pretty darn smooth. It's not "sticky", either; you need very little effort to start the mouse moving. The Pro also feels nicer on the heel of your hand than a plastic mat, if you ask me. The Pro in close-up. 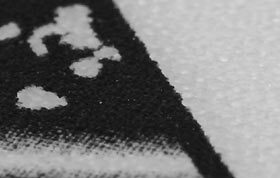 Click the image for an extreme close-up. The surface is only mildly fuzzy, so it shouldn't gum up opto-mechanical mouses. Opticals don't care, of course; seldom does fluff or dust manage to impede the view of the tiny camera inside an optical mouse, and if it does you can just blow it out. XTrac say the distinctive dithered-hexagons pattern printed on their mats will help optical mouses track better, and I dare say it is pretty close to an ideal imaging surface. Practically any non-transparent surface with a bit of texture to it will do for modern optical mouses, though; it's quite hard to find a mouse mat, or non-polished desk for that matter, on which opticals won't work well. For what it's worth, though - if your optical mouse sticks, skips or jitters when you use it on an XTrac pad, and you've already cleaned its lens, then it's definitely time to get a new mouse. The Zoom mat has the same pattern as the Pro, but it's printed larger. The Zoom has the same official 8.5 by 11 inch size as the Pro, and the Zoom I got for review actually is that big. 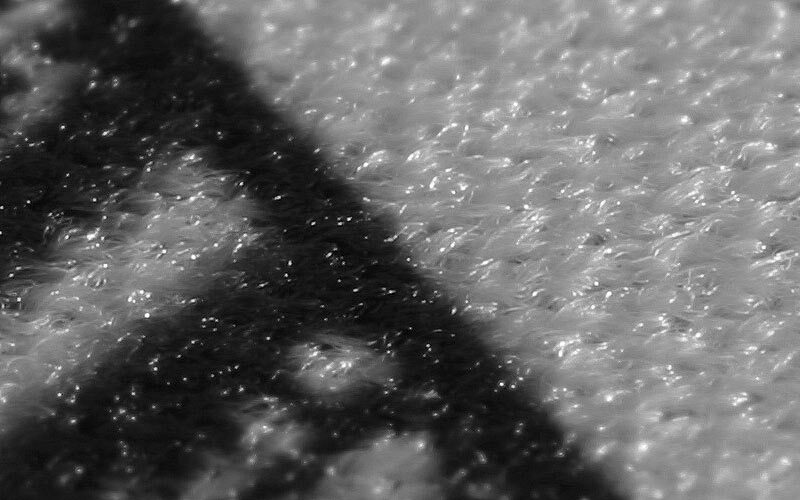 The Zoom's really thin, though; about 0.7mm. XTrac say that this means you can tuck it under one side of your keyboard without making the 'board wobbly or obviously tilted, and they're right. There's actually a point to this, because the Zoom's slick white rubber back doesn't stick it to the desk as well as the Pro's seriously non-slip backing. Tuck the edge of the pad under the keyboard feet, and it won't be going anywhere. 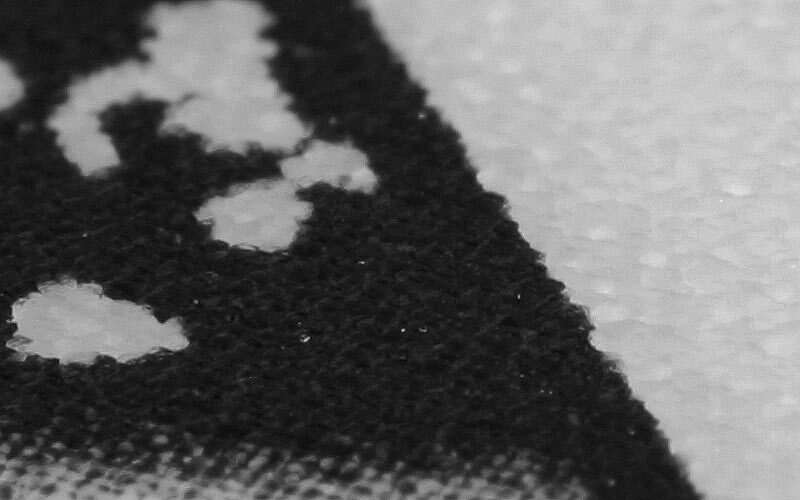 The face of the Zoom is a fairly hard, very thin plastic layer, with the sort of micro-mountainous textured finish that every hard plastic mouse pad has. The Zoom's finish makes it very slick - about as low-friction as a new Everglide, I think. 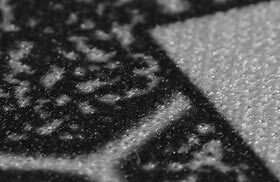 That surface in detail. The tough plastic can be cleaned very easily, as with all hard plastic mats. In use, the Zoom felt to me like various hard plastic mats, except a bit warmer under my hand. Its texture is finer than that of most hard mats, and it's a bit slicker than the polyethylene Everglide Optical I was using before - but the Optical's been worn in for quite a few months now, so it's not as slick as it was when new. As with grooved racing tyres, the more you wear a textured mouse mat, the closer it gets to being completely slick and the more grip it has. Unlike almost all tyres though, grip is a bad thing for mouse mats. I made a token effort at scientifically measuring the actual relative friction of the three pads. To wit, I rigged up a contraption involving a tea mug, a plastic bag, some thread, a set of hemostats one of whose smooth finger-holes served as a low friction thread-bearing, and various small dense objects. Regrettably, I did not photograph this arrangement, which means dictionary entries for the word "gimcrack" will have to remain forever without their most perfect possible illustration. Anyway, I found the assortment of objects needed to pull the mug across the Pro, the Zoom and my Everglide, and then weighed those assortments. I used the mug rather than a mouse partly because the mug had a handle I could tie the thread to, and partly because mouses just move too easily over slick mats. I wanted to wind up the friction to make the operation less fiddly. The Pro needed 209 grams of stuff before the mug moved consistently. The Zoom needed only 142 grams. This lined up pretty well with my experience of pushing a mouse around on them; it's hardly a precision measurement, but I think it's pretty much right. The Everglide, however, needed a mere 85 grams, which didn't add up. The Zoom and the Everglide felt much the same when I moved an actual mouse around on them. By the advanced diagnostic procedure of pushing things with my finger while scowling at them, I concluded that the glazed pottery of the mug just happens to grip the XTrac plastic better than it grips the Everglide surface. I've Mouse Waxed the Everglide mat more than once, so that could account for it too. Well pleased with my ad hoc hypothesis explaining away the inconvenient result as experimental error, I went on to consider matters financial. XTrac pads are available from several dealers, for several different prices. The Pro sells for less than $US10, on average, ex shipping; the Zoom averages less than $US14. More places sell the Zoom than sell the Pro, because there's a newer "Pro HS" with a Zoom surface on Pro backing, which many dealers seem to be selling instead of the original Pro. Whatever XTrac pad you get, you're looking at pricing that's pretty much on par for fancy mats - "on par" being defined as "about the same as Everglide charge". Everglide mats haven't always been good value - their dalliance with cheap but quick-wearing polystyrene didn't win them any friends - but it's hard to justify spending much more than this on a mouse mat, unless it's some spectacularly gorgeous embroidered, inlaid and animated showpiece made by gnomes in another dimension. The XTrac Pro is, I think, a great mouse mat for anybody who likes a higher drag surface than plastic mats provide, but who doesn't want a really draggy old-school pad. The fuzzy microfibre MicroTracker pad I reviewed here is a better choice if you like a lot of friction, as some people do. Practically no gamers like high-drag pads, but, I'm sorry to say, there's more to computers than playing games. 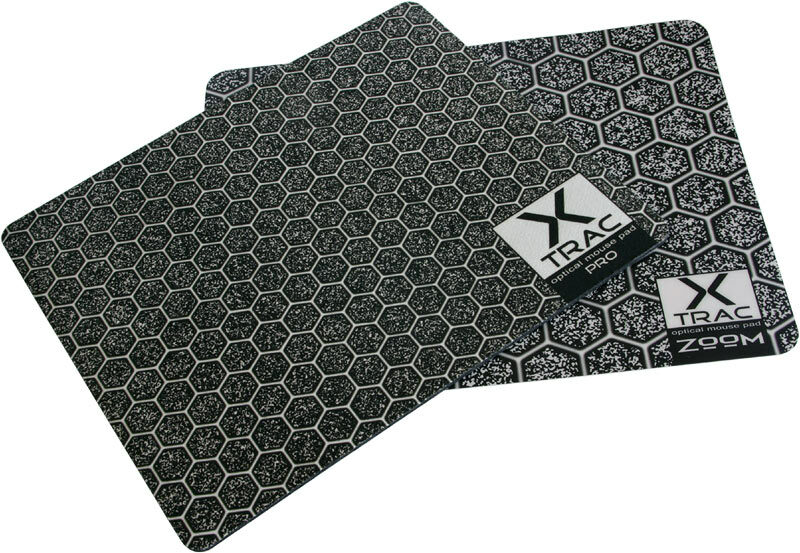 If you don't want tons of drag but do want a nice cloth pad, though, an XTrac Pro is a quite safe buy. The XTrac Zoom is super-light, super-thin, not particularly creaseable, very slick, and cool looking, too. If you can buy quality hard plastic mats where you live but would have to send away for a Zoom then I don't think there's much justification for getting one, and I also have no data on how fast the Zoom will wear out. But, for about the same money as a hard plastic mat, the Zoom's a good-sized thing that gets the job done and will save you some grams in your LAN party bag. Does the world need yet more mouse mat options? No, not really. But if every other premium mouse mat vanished tomorrow and all we could use was XTrac products, we'd be fine. Review mouse pads kindly provided by XTrac.